Oban is a resort town within the Argyll and Bute council area of Scotland which is the unofficial capital of the West Highlands. It is well-known for its ferry services to the Hebrides, which has given the town the nickname ‘The gateway to the Isles’. The town is also rightly proud of its fishing industry, which has given Oban its second nickname ‘The seafood capital of Scotland’. Despite its small size, during the tourist season the town can play host to up to 25,000 people. As well as being a popular tourist destination in its own right, Oban is the main ferry terminal for routes to the west coast islands. The town can be reached easily enough by road, although the journey will undoubtedly take a little longer than expected due to frequent stops to appreciate the beautiful landscape along the way. Most people choose to drive to Oban so they get the chance to fully appreciate the Argyll and Bute scenery, and the two main cities of Glasgow and Edinburgh are only around 2 1/2 hours away. If you’re driving from the direction of Glasgow then there are two primary route options; either the A82 via the west side of Loch Lomond, or the A83 over the Rest and be Thankful and via Inveraray. Edinburgh is an easy drive via the A85. 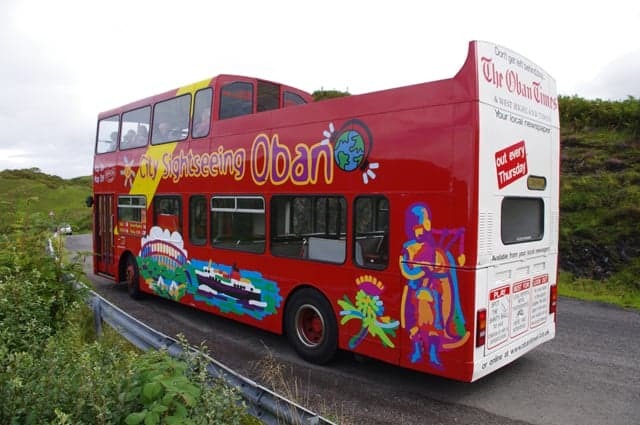 Oban can also be reached by train and coach from Glasgow, Edinburgh and Inverness. While you’re in the town your best option for getting around is to either use a car or the local bus service. West Coast Motors operate bus routes around Oban and to the surrounding villages north and south of the town, although Oban itself is compact enough that you can easily walk it. If you want to explore the surrounding area by train, then the Glasgow line stops at a number of villages along the way, including Connel, Taynuilt, Loch Awe and Dalmally. If you wish to fly you can take the daily flights from Glasgow airport which land 5 miles outside of Oban, and Oban Airport serves the islands of Coll, Tiree, Islay and Colonsay if you want to head out to the islands during your trip. If you want a car after arriving at the airport there are several local companies which offer car rentals, or you can use one of the local taxi services which also pick up from the airport. West Coast Motors operates an extensive network of local bus services in and around Oban, the Isle of Mull and throughout Argyll and Bute. There are also coach services operated by Scottish Citylink that run from Oban to Fort William, Skye, Mid Argyll, Kintyre and Glasgow. West Coast Motors operate local bus services throughout Argyll and Bute and they also operate an open-top bus tour during the summer months. Visit the West Coast Motors website for further information. Most people visiting Oban are intending to continue their journey out to the west coast islands, so if you want to arrange sea-bound transport visit the CalMac website to book your passage. CalMac Ferries provide ferry links to some of the most idyllic islands in the world, and it’s easy to sail from Oban to discover the Inner Hebrides using their various ticket options. Visit the CalMac website to search for timetables and fares, but note that sailings may be affected by the weather so check their website before leaving home. Taxi services in Oban are rather limited in comparison to the big cities, but there are several firms that can be booked. Please view this website for a list of Oban taxi firms.